Let me start out this review by asking you all a question. 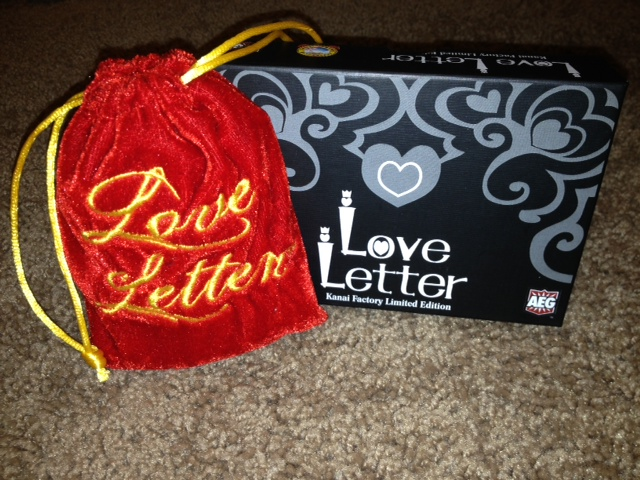 Have you ever received or written a love letter (or maybe e-mail/text/IM etc.)? There is a certain excitement that comes from receiving or writing words that express your love to another. Now, even though the excitement and perhaps anxiety isn't the same, the game Love Letter really creates a fun anxiety and excitement and it does it all with just 16 cards. The theme I think fits really well into the game play and one other interesting thing to note along with the theme, is the fact that this game is actually game 4 in an AEG series called the Tempest series. All of these games use the same characters and build off of previous games in story and development of that realm or world. A really cool idea to link games together and truly make a "series" out of it. While I have not played any of the other games in the series, I look forward to the opportunity! Love Letter fever has spread fast and furious around the world like a disease outbreak chain in Pandemic folks. If I was tasked with squandering and curing the world of this fever, I would fear the task too great. 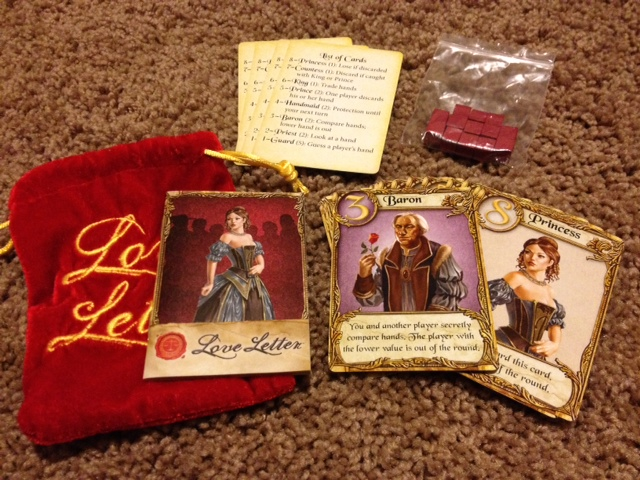 Love Letter has become very popular for good reason. Now, I'm not saying that means that it is a game for everyone, but there is just too much good things happening with the game not to ignore it. Some of you out there who are used to judging a book by its cover, may dismiss this game just by the name alone. I hope you don't. 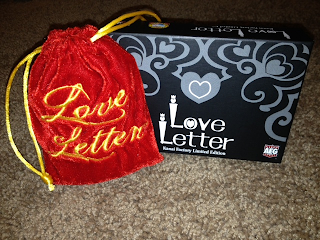 Trust me, something that Love Letter is definitely not, is one of those teen dating games. 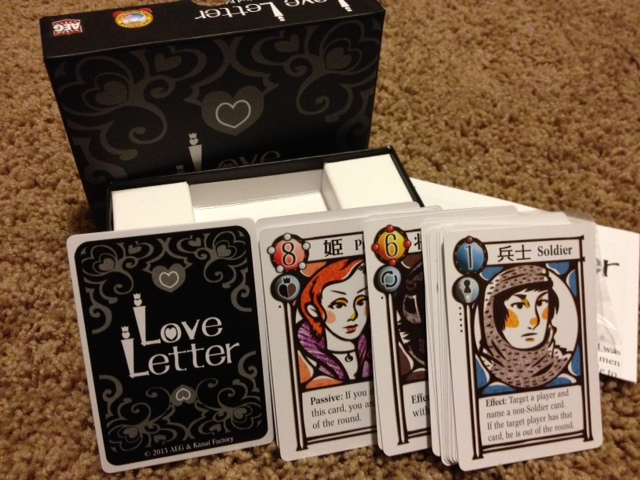 Love Letter is a simple card game consisting of only 16 cards and a few counter pieces. Keeping the game simple allows for a greater age range of players who enjoy the game, and in this case, the game price is minimal as well (all of our budgets can appreciate a great game cheap). The game really doesn't take that long at all to play (assuming you don't have people who take 5 minutes to decide one simple choice). Today we will look at two different versions of the game (artwork of the cards is really the only thing that changed along with the names for the cards). Not much to discuss here as I have already said that the rules are really simple and with only a few cards and tokens to keep track of game progress, everything is well put together and great quality. The artwork for the cards is really well done for both versions although very different from one another. The rules are clear and taught very easily. The wooden cubes or tokens in the game represent "tokens of affection" from the princess and these are basic wooden cubes. I would have liked to see something like little metal wax seals as tokens in the limited edition version, but they stuck with the wooden cubes. The velvet bag for the original version is nice and I actually like it as it contains everything for very easy transport. 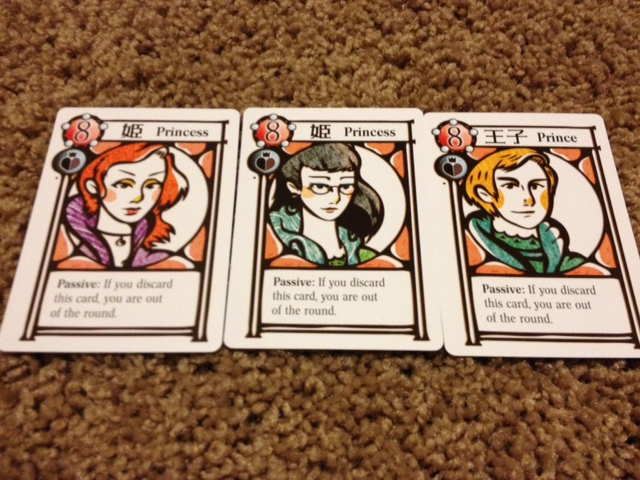 So, in this particular Tempest game, everyone is trying to court or win the heart of the beautiful Princess Annette (in the limited edition version, one of the fun things included in that is actually 3 different cards that take this role, you can choose the princess with or without glasses, or you can even change the gender to a prince). 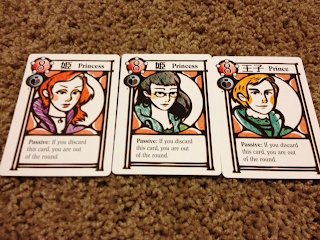 It is a simple thing, but offering 3 different choices for this card really helps with the theme of the game, especially having the option for a prince when playing with an all female crowd (yes, girls love this game too!). 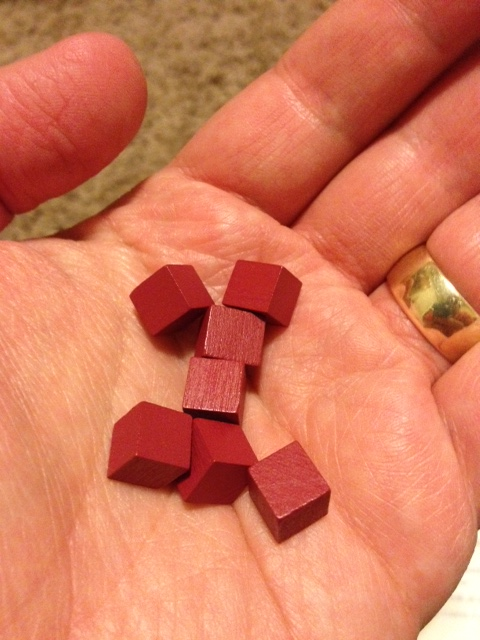 Players play rounds and the winner of each round obtains a token of affection (a red wooden cube - really princess? I'm worth a red wooden cube to you?). The winner is the first to a set number of these cubes (player dependent). So, how do you obtain these precious cubes? Players are all dealt one card each. Players on their turn then perform two actions. They draw a new card from the stack and then they play one of the two cards from their hand. 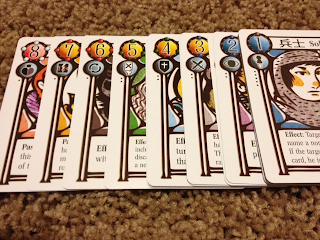 Each card has a point value and special action or constraint on them and the player must abide by those. You can win a round by being the last person still in the round, or if all the cards are drawn having the highest valued card at the end of the round. So, that brings up the question, well, how does one get eliminated from the round? This is done by using the actions of the card you choose to play for that round (this card gets played in front of you on your play stack). 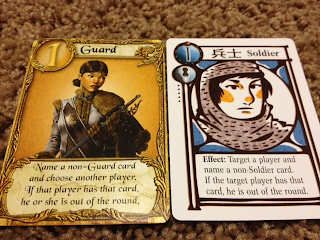 For example, the guard allows a player to guess what card a player has. If they are correct in that guess, that other player must reveal their card and is out of the round. If the guess is wrong, then nothing happens special for this round (the player doesn't need to reveal the card - no bluffing either!). 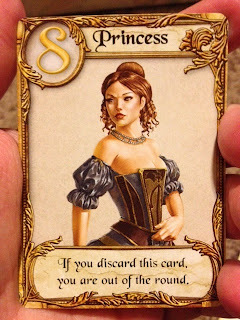 There are 8 different types of cards total and actions include looking at other peoples cards, protection from other cards for the round, and one of the most important ones - the princess card can't be discarded or played from your hand or you are out of the round. Yes, the princess card is the highest value card (you obviously would like to deliver your love letter in person if you can), but others (or other cards) may make you discard it pushing you out of that round. I won't go through each card, but they are all very easy to understand and are all pretty interesting. Some of the name changes in the limited edition version were really interesting. 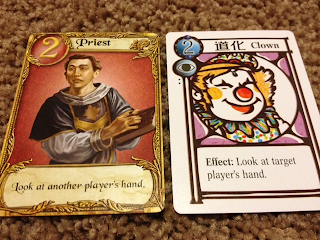 I thought that the change from priest to clown was particularly interesting. The other thing on the limited edition cards that you will notice, is that they provide little symbols that represent the action of those cards as well as the little dots along the side remind players how many of that type of card are in the deck. Let's start with a few key points and some short discussion, and then I can hopefully close this review up like a well written letter and seal it with my stamp of approval. The game is short (or at least each round). - Depending on each round, the game can be really short. I know that when I played for the first time with just me and my wife, there were multiple occasions that one using the guard guessed the other players card the very first card of that round. Sometimes the fact that you can get out of the round so fast can be very frustrating, especially if it happens the entire game. There is a lot of luck to the cards you are dealt and this can fluctuate the length of the game. The choices you make really are not too complex and so it shouldn't take people long to play on their turn (but there seems to be always one player in a game group who over thinks things and takes forever no matter what game - you know who I am talking about - you may even realize that that player is you). The game is simple. - 16 cards, 8 different ones, be the last one standing or at least the "highest" one standing. Draw a card, play a card. The simplicity is one of the big bonuses of this game and it really allows younger kids or inexperienced gamers to get into the game. Low Strategy, Higher Luck, Lots of Fun. - So, with the great simplicity of the game, the game is pretty heavy on the luck side (don't get me wrong, there is also a great deal of strategy when playing to bluff and know when to play what as well) as you are relying on what cards are dealt to you and to others. When you guess someone's card without really an inclination if that is what they really had etc. happens and can happen a lot in a single game. 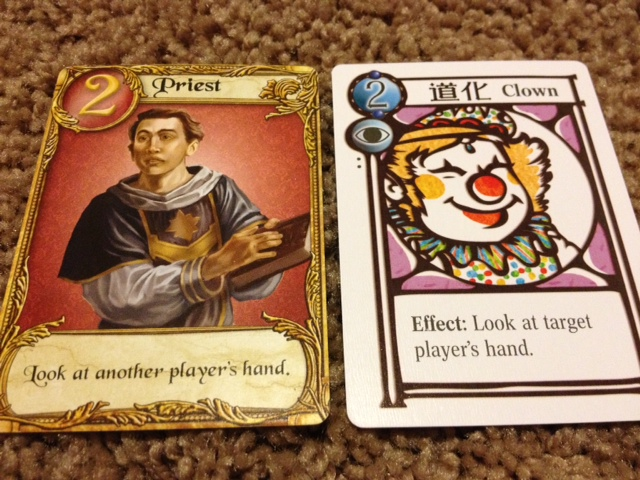 You only have two cards in your hand, so there isn't a lot of complexity to strategically playing what you have. I know some struggle with the game because they feel that because of the limited cards and game play that the choice is really obvious or really the cards force you to play one or the other to still stay in the game. So while the game is simple, you do loose a lot of your strategic game play. You do not however, in my opinion, loose the fun factor. Some of the funnest games can be complete luck. 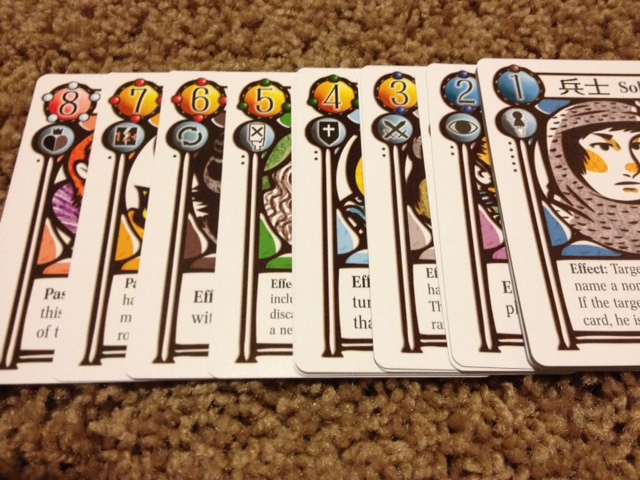 This is a great game for those looking for a light card game that all ages will enjoy. The game is a great filler type game for those more strategic gamers who need a little something to cleanse their gaming palate before that next 2 hour game of Risk or Power Grid. The game shares some similarities with the card game Coup (which I backed on Kickstarter and should receive in the next few months). The game will appeal to a great majority of people. Just remember that the game is meant to be light and quick and that the luck to the game is all part of the fun! I give this game 3 fingers up or 8 out of 10 stars. Happy wooing and may you win the affection of that beautiful princess or handsome prince you are looking for or be lucky enough to have already won that affection (as I have) and that is How Lou Sees It. A big SHOUT OUT to AEG games for making this review possible! Also, keep checking back for my next game review on AEG's Guildhall Job Fair and many more! I will eventually be updating the look and rating system of my blog soon too!